The ultimate goal of most sports championships may be to win, but the symbolism of victory is just as important, especially as time goes by and the Big Game fades into history. 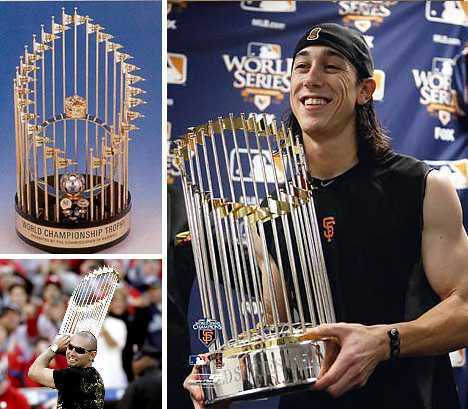 These 10 sports championship trophies are indeed historically significant, in many cases being far older than the teams that compete for them. 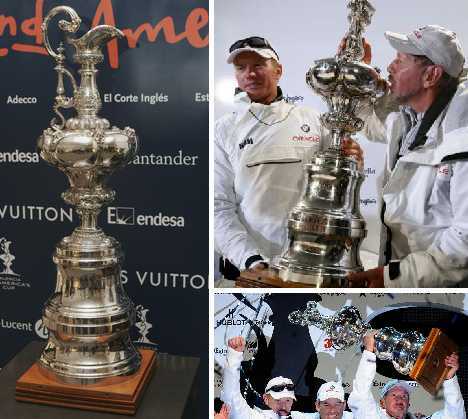 Arguably the oldest current championship trophy, the America’s Cup is a silver ewer crafted by Great Britain’s Garrard & Co. in 1848. Originally named the “R.Y.S. £100 Cup” (RYS standing for Royal Yacht Squadron), the cup was first awarded on August 22, 1851 to the owners of the schooner America after its victory in the Royal Yacht Squadron’s 1851 Annual Regatta around the Isle of Wight. 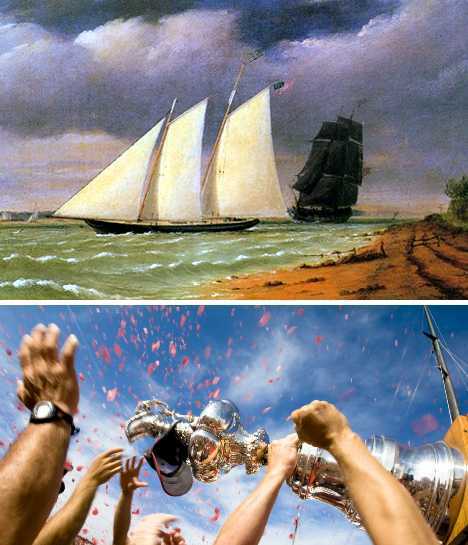 Following America’s victory, the trophy was renamed the America’s Cup and was held at the New York Yacht Club for the next 132 years as NYYC-sponsored yachts successfully defeated every challenge. Finally in 1983, the yacht Australia II, owned by the Royal Perth Yacht Club, ended the longest winning streak in professional sports history. Affectionately known as “the Auld Mug”, the original silver ewer has been modified several times by having its base extended to accommodate the names of race winners. 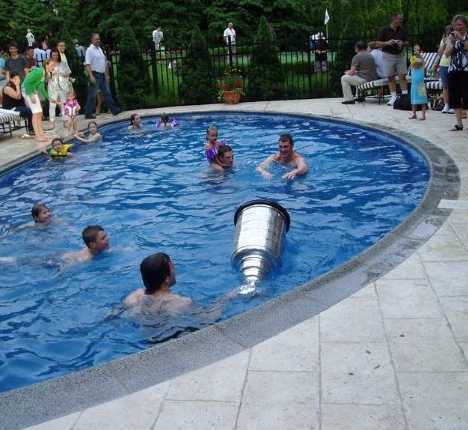 The Stanley Cup is awarded to the National Hockey League’s playoff champions at the climax of each season. The original trophy was donated in 1892 by Lord Stanley of Preston, the Governor General of Canada, to the country’s top-ranking amateur ice hockey club. As such, the NHL’s most prestigious trophy predates by several decades the establishment of the NHL itself. 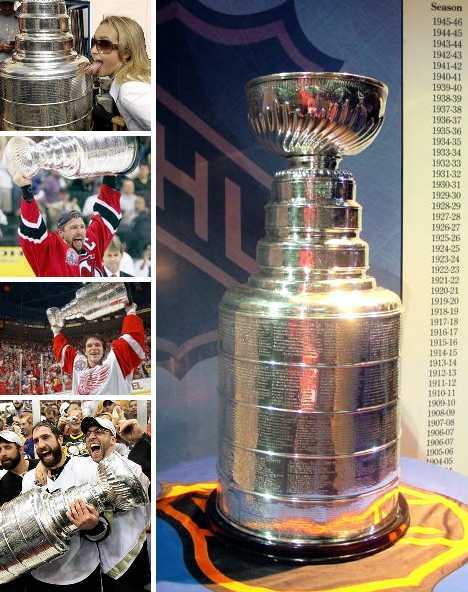 The Stanley Cup has been modified many times over the past century due to the requirement that the names of the players, coaches and staff from each year’s champions be engraved. The current version of the silver and nickel-alloy trophy is 35.25 inches (89.54 cm) tall and weighs 34.5 lbs. or 15.5 kilograms. It’s also waterproof… luckily. 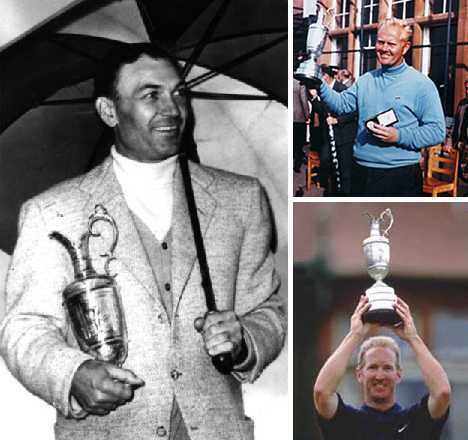 The Claret Jug, formally known as The Golf Champion Trophy, dates from 1872 and is awarded to the winner of each year’s British Open, one of professional golf’s four major annual tournaments. The winner’s name is engraved on the original silver trophy immediately before presentation, and the winner is allowed to keep the trophy for a full year – it must be returned before the next year’s British Open begins, upon which the previous year’s winner is presented with an engraved replica. The original Claret Jug is housed in a glass display cabinet in the clubhouse of the Royal and Ancient Golf Club of St Andrews since 1928. The silver claret jug is inscribed ‘The Golf Champion Trophy’, and was made by Mackay Cunningham & Company of Edinburgh, Scotland for a mere £30. The trophy replaced the previous award, the Champion’s Belt, which was a red leather belt with a silver buckle. Good thing too, if you’ve ever tried drinking champagne out of a belt! The Vince Lombardi Trophy has been awarded to the winner of pro football’s Super Bowl since January 15, 1967, when the NFL’s Green Bay Packers defeated the AFL’s Kansas City Chiefs by a score of 35-10. The trophy received its current name in 1970 as a tribute to Lombardi following his tragic death from cancer. 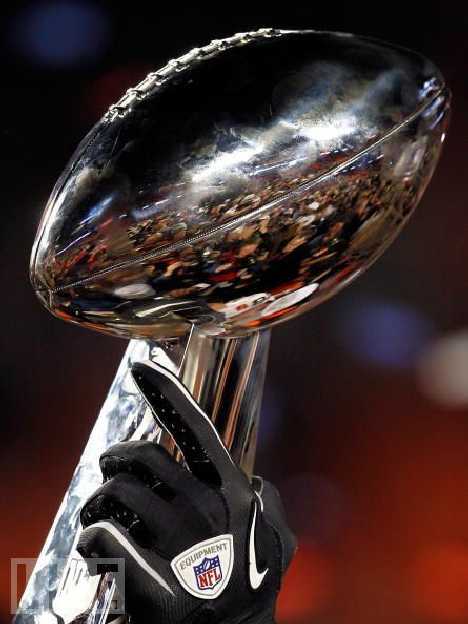 Unlike other professional sports trophies like the Stanley Cup, a new Vince Lombardi Trophy is crafted each year and presented to the Super Bowl winning team, after which it is theirs to keep in perpetuity. The Vince Lombardi Trophy carries significant intrinsic value as it is made by Tiffany & Co. entirely from sterling silver. The trophy is 22 inches (56 cm) tall, weighs 7 pounds (3.2 kg), and is made over a period of approximately four months requiring 72 man-hours of labor. 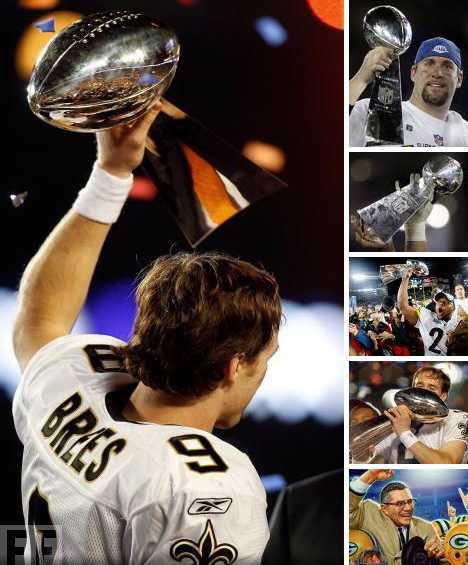 At today’s current precious metal prices, the trophy is valued at upwards of $50,000. 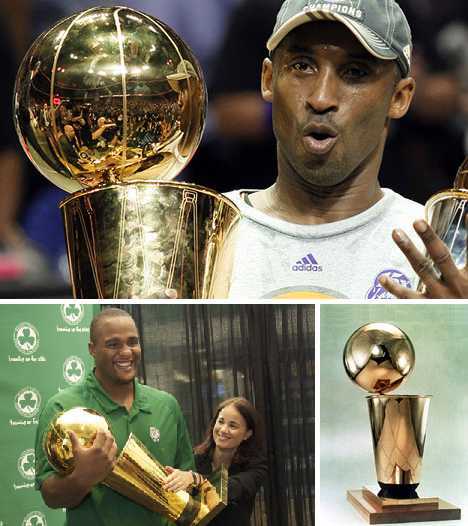 Ask the average sports fan what the Commissioner’s Trophy is and often as not your reply will be a blank stare. Show them a photo, however, and “the World Series Trophy” registers immediately. The trophy, which is awarded annually to the victors of Major League Baseball’s World Series, is presented by the Commissioner of Baseball (currently Bud Selig) and is the only one of the four major North American sports championship trophies not to be named after an actual person. The Commissioner’s Trophy, like pro football’s Vince Lombardi Trophy, is made by Tiffany & Co. and has an estimated value of $15,000. It has been awarded 42 times since the St. Louis Cardinals won the World series in 1967 and again, like the Vince Lombardi Trophy, is made from scratch each year as the winners get to keep the one they’re awarded with. The Grey Cup is awarded to the winners of the annual Grey Cup Game, the penultimate game in every Canadian Football League season. 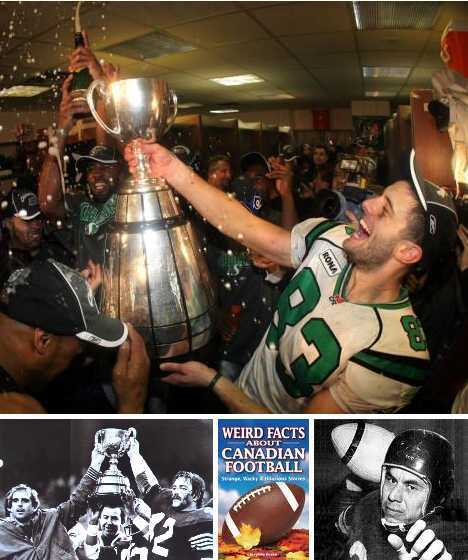 First awarded in 1909, the Grey Cup has grown from a silver loving cup to a much taller trophy decorated with engraved plates bearing the winning team’s name and those players who suited up for the championship game. As these plates will be completely filled in 2012, the Grey Cup will need to be enlarged or redesigned for the 2013 CFL season. The Grey Cup is reused from year to year and must be returned by the winning team each year. 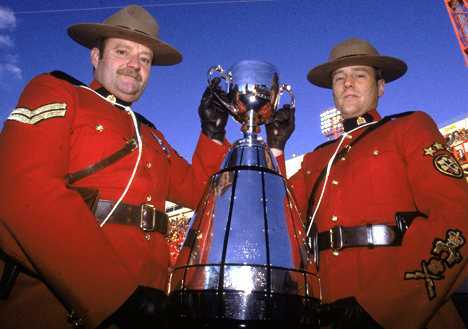 Over its nearly century long history, the Grey Cup has endured more than a few breakages. One notorious example occurred in 1987 when a player from the Edmonton Eskimos sat on it during post-game celebrations. In 1969, the Ottawa Rough Riders defeated the Saskatchewan Roughriders 28 to 9 to win the Grey Cup, which was subsequently stolen and held for ransom. The CFL refused to pay and an anonymous tip led to police recovering the Grey Cup from a hotel locker. 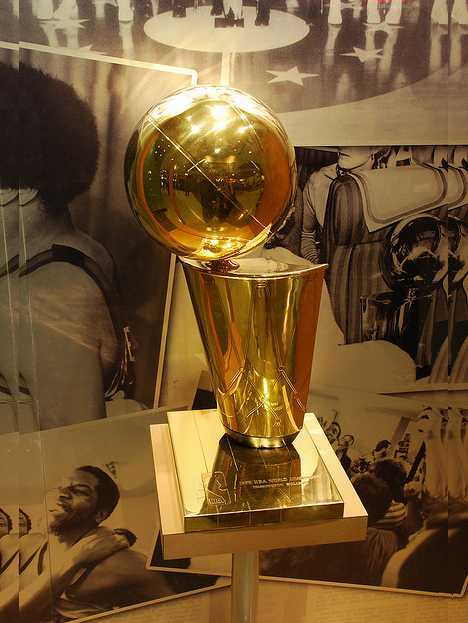 The Larry O’Brien Championship Trophy, named for late NBA commissioner Larry O’Brien in 1984, has been awarded to the winner’s of the National Basketball Association’s championship game since 1977. The trophy may be young in years but already certain traditions have sprung up around it, including it’s appearance in the annual NBA champions’ celebratory parade. The trophy’s 9-inch wide upper portion is meant to resemble a basketball and is hollow with a hinged lid. Winning teams often fill the trophy with dip and enjoy “dunking” tortilla chips during post-victory celebrations. No telling if any double-dipping controversies have arisen. Tiffany & Co. creates a new Larry O’Brien Championship Trophy every year from 14.5 pounds of sterling silver and vermeil overlaid with 24 karat gold. The trophy is currently valued at $13,500… now that’s Dorito-dipping in style! The 22-inch (55 cm) tall trophy is the permanent property of the winning team and the Los Angeles Lakers have the largest collection so far: eight! The FIFA World Cup Trophy was first introduced in 1974 and is awarded to the victors of soccer’s quadrennial World Cup match. The trophy stands 14.4 inches (36.5 cm) tall and is made of 11 lbs. (5 kg) of 18 carat gold. First awarded in 1974 to World Cup hosts and champions West Germany, the World Cup Trophy features the names of the winning teams on its underside, and after 2038 all the available space will be filled. 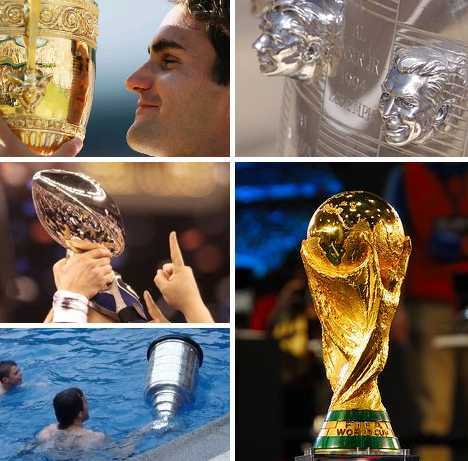 The World Cup Trophy replaces the Jules Rimet Trophy, which was won by Brazil in 1970: as it was their third time winning the World Cup, Brazil also won the right to keep the trophy. 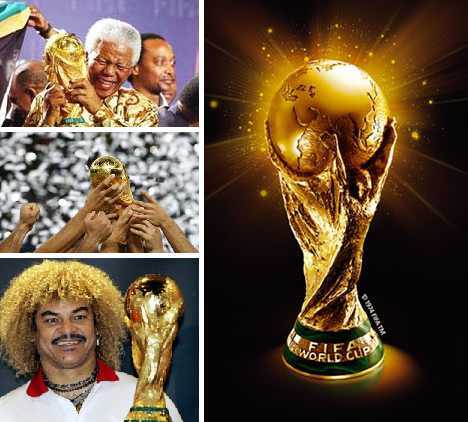 New rules instituted by FIFA state that the solid gold World Cup Trophy cannot be won outright – winners are presented with a gold-plated replica instead. 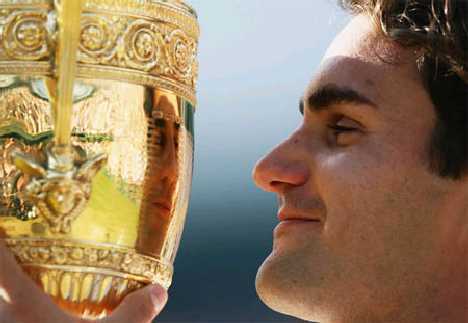 The most prestigious trophy in professional tennis is the Gentlemen’s Singles champion’s trophy, an 18.5 inch (47 cm) tall and 7.5 inch (19 cm) wide gilt silver cup awarded at Wimbledon each year. Though Women’s and Doubles champions are also awarded trophies, the Gentlemen’s Singles champion’s trophy takes precedence having been awarded since 1887. The Gentlemen’s Singles champion’s trophy has remained unchanged and unmodified since 1887 and winners spend mere moments with their prize following its presentation – after which the cup is returned to its secured display case at the All England Lawn Tennis Club. Don’t feel too bad for the champs, though, current price money for the Gentlemen’s Singles winner is £850,000 plus (since 1949) they receive a miniature (8.5 inches high) replica of the trophy. 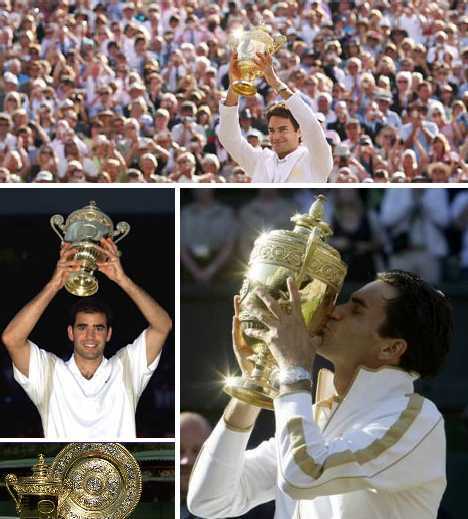 American Pete Sampras has 7 of them in his own personal secured display cabinet. Perhaps the largest trophy in pro sports is the Borg-Warner Trophy, on display at the Indianapolis Motor Speedway Hall of Fame Museum in Speedway, Indiana. The trophy symbolizes victory in the Indianapolis 500 automobile race first held in 1911. The trophy itself was first presented at a celebratory dinner in 1936 and exudes Art Deco elegance and style. It stands 5 feet, 4 inches (162.5 cm) tall and weighs 153 pounds (45 kg). Commissioned at a cost of $10,000 – big money in the depths of the Great Depression – the Borg-Warner Trophy is estimated today to have a value of more than $1.3 million. 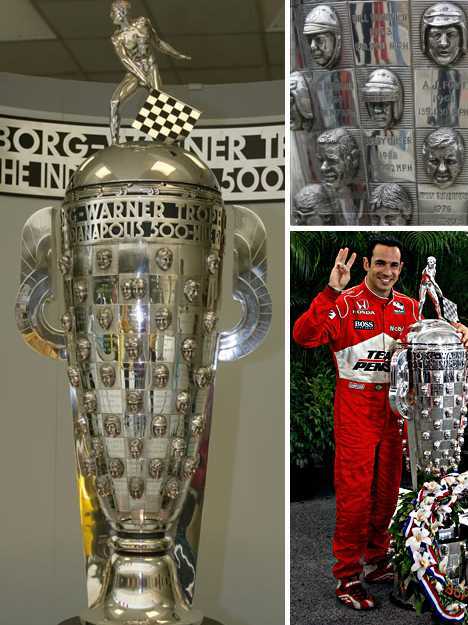 The Borg-Warner Trophy’s unusual design features the embossed faces of each Indianapolis 500 winner rendered in a checkerboard pattern. Since 1988, Indy 500 winners have received a downsized replica of the Borg-Warner Trophy that stands 18 inches (46 cm) tall. The current trophy replaces the 24 inch (61 cm) tall replica that was mounted on a walnut plaque. If you’re wondering about the trophy above… don’t ask, don’t tell! Just kidding, it’s the 3rd place trophy awarded at the Army National Guard’s annual Combatives Tournament. Said by some to be the worst-designed trophy EVAR, at least it gives competitors a little extra incentive to win 2nd or 1st place – not that there’s anything wrong with that.